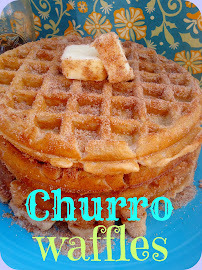 I envy anyone who hasn't ever had the chance to taste all the crispy, crunchy, spicy sugary goodness that is a Churro! For me I consider them one of those super hero desserts that are in the league of their very own, they join the ranks of other long time dessert rock stars. The classic chocolate chip cookies, chewy fudge brownies, warm apple pies and rich vanilla pound cakes each one with the over bearing potential to plumpt your from any diet plan with one simple taste of a crumb. There's almost nothing that could make them any better, oh how enticing they are in their very own straightforward decadence! The ideas of these desserts reaching anything more gratifying are almost non-exsistent!.........Until you welcome them to a world of pecans, walnuts & salty peanuts, white chocolate chips, dulce de leche. To a land where mounds and mounds of sweet whip cream make a pillowy bed for ripe red strawberries. OHhhh, the possibilities are limitless. 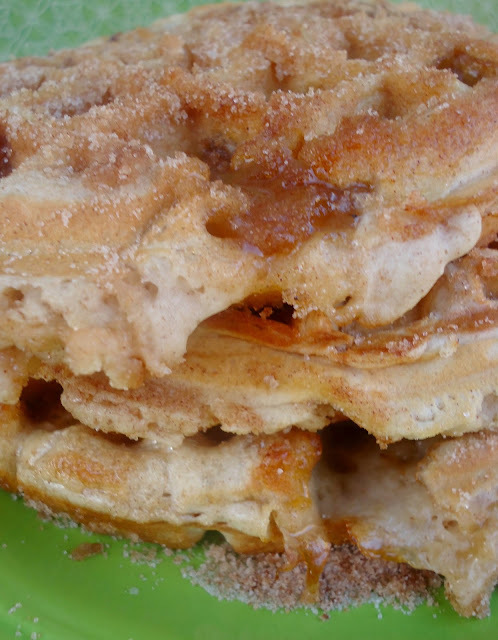 So that brings me back to my amor for everything Churro, in the couple of weeks since I posted my original churro waffle recipe I've seen them loved and adored by many! They've been blogged about and blogged about, pinned and repined, all of this attention has not only thrust me into the cielo ( heavens) but it has also let me see just how many of you adora ( adore) Chrurros as much as I do! Which in turn caused me once again to think of Churros in all their super hero glory. and that lead me to ponder whether or not just like their rock star counterparts Churro Waffles could be any more irresistible? And the answer was an undoutable Si!! Roll them in cinnamon- sugar love, dip them in the beloved melted butter, but this time stuff them with plump, tangy apples. Wow, The result was perfect marriage! An American classic with a Mexican twist.......and a new breakfast tradition is born from such sweetness! If your feeling really ambitious you can make your own apple filling. I found a recipe here. 3. 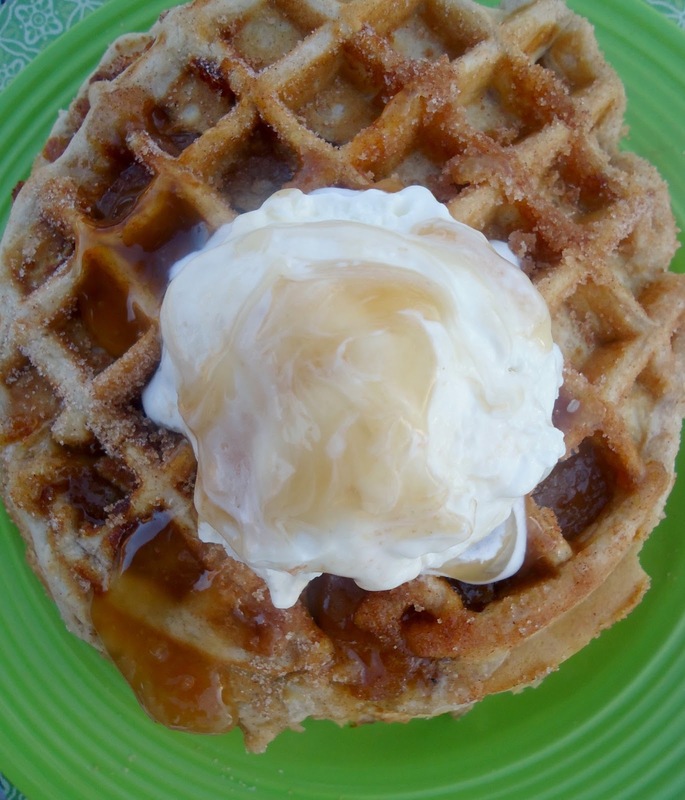 At this time you can also melt your 1/2 cup of butter used to pour over waffles. 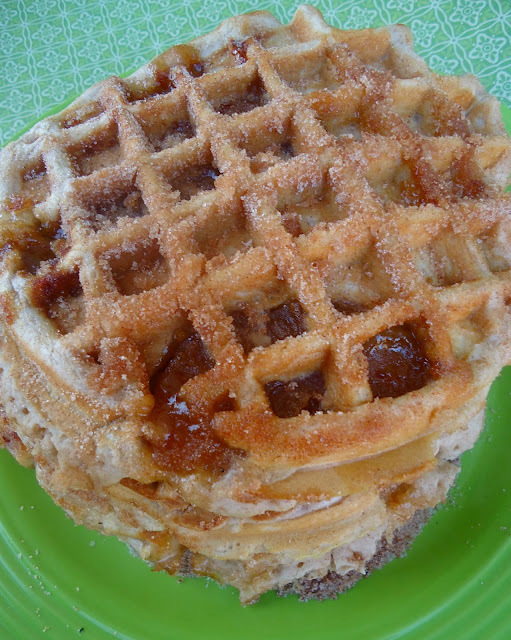 Next generously spray your waffle iron with no stick cooking spray. 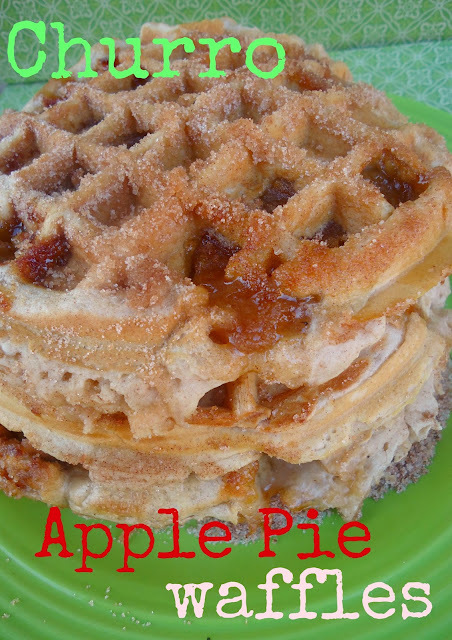 Than ladle a little batter into a preheated waffle iron, gently place on 4-5 apple slices ( depending on size of your waffle iron, smaller size use 2-3 apples. 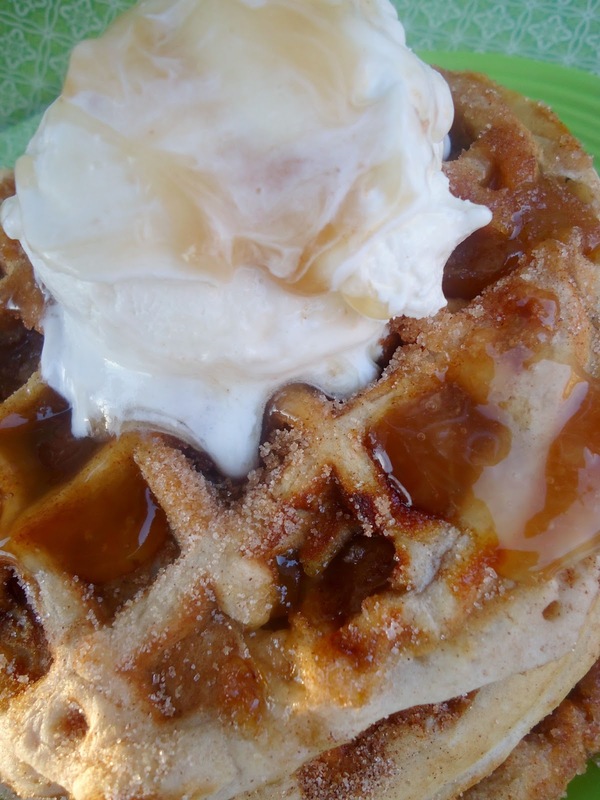 5.Once fully cooked immediately pour melted butter on each side of the waffle and than dip each buttered side into your cinnamon/sugar churro mixture. At this point if your mouth is not watering from the smell, check your pulse! Umm- these sound amazing!! I love dessert for breakfast! I am your newest follower! I love the way you write! 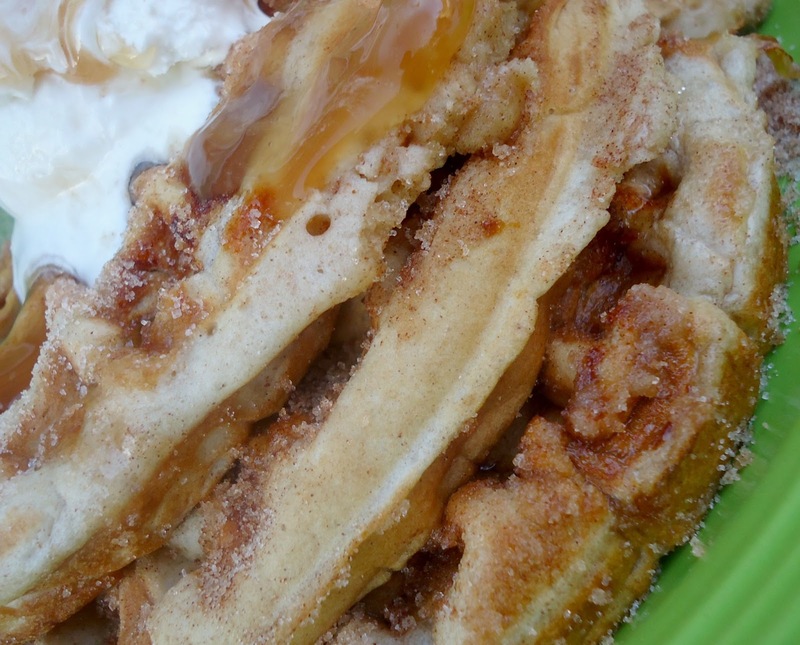 & your churro waffles look too good to be true! @Christi, dessert for breakfast is the way to go! Muchas Gracias, for the follow! 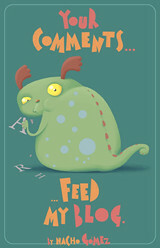 @kurioskitteh, I'm blushing....thank you for the sweet comment! I hope you both come back soon! Those look so good! 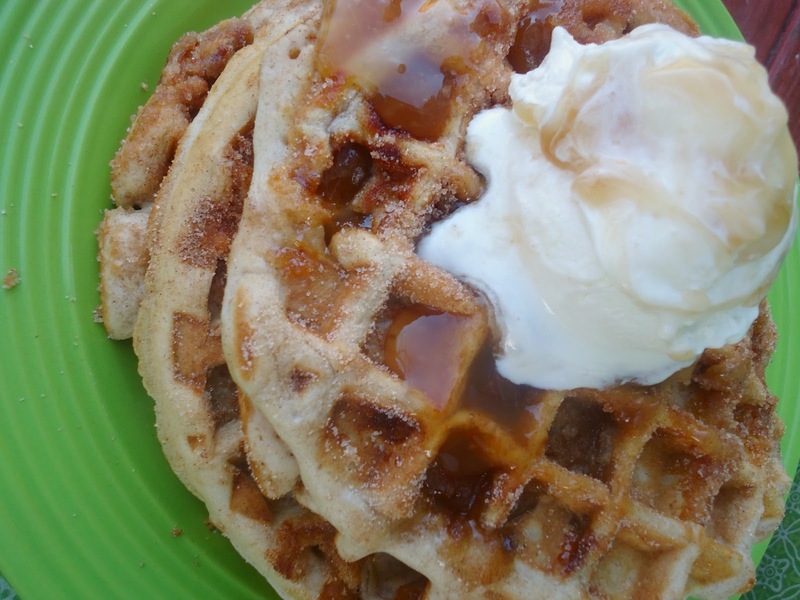 You may have found a way to make waffles even better. Thank you so much for linking up at What's In Your Kitchen Wednesday--I'm loving your blog! Be sure to stop back by tonight and see these featured on my site. :-) Have a great week! 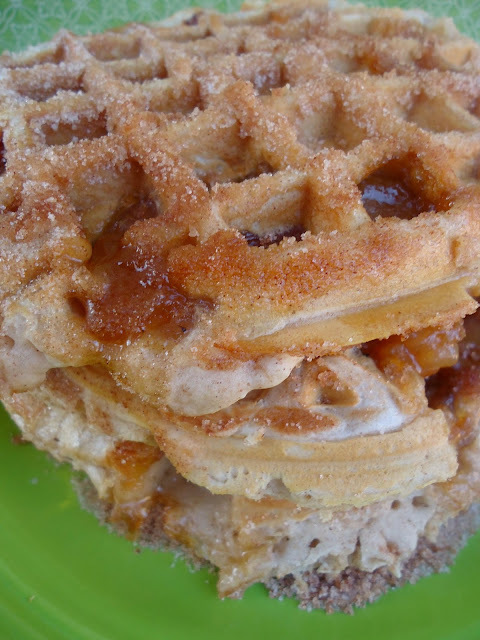 You had me at dulce de leche. I will definitely try this out! Mama Mia those look amazing! 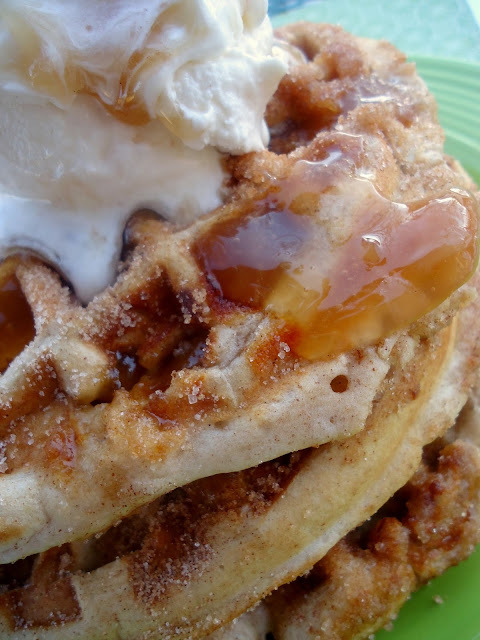 I'm a huge cinnamon fan and I know I'll be making these soon! THANK YOU! The pie sets up beautifully! And smelled sooooo good while baking. Hola!, I'm Jasmine aka Chica Chocolatina an aspiring Spanish teacher with a love of Latin American culture including the food and the language. I also have a passion for baking and creating yummy desserts. When these two worlds collide you get dulce desserts, with delicioso crumbs and a scrumptious marriage of these two passions. Some Chica Chocolatina goodies are inspired by real Latin American desserts others just have adorable, irresisitably, entertaining Spanish names. No matter what the origin these confections,they are sure to be one of a kind and delicious, leaving your taste buds wanting MUCHO MAS!